MediScent Tea Tree Dog Shampoo acts as a disinfectant and helps to heal and soothe skin irritations, fungal infections, flea bites and irritated skin. 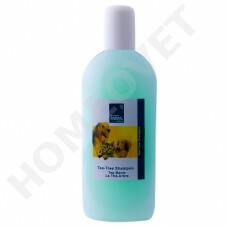 Tea Tree Shampoo helps to heal and soothe skin irritations. Tea tree oil in a diluted form, is an excellent anti-inflammatory, so it helps reduce skin inflammation that can lead to itchiness and irritation. Shake well before each use. Wet coat thoroughly with warm water. Apply shampoo to head and ears, then lather. Do not get shampoo into eyes. Repeat procedure with neck, chest, middle and hindquarter, finishing with legs. Allow shampoo to be absorbed for 5 minutes then rinse thoroughly.